Motorcycle vs car. It’s a debate as old as time. Or, at least as old as automobile manufacturing. Still, the debate rages on. 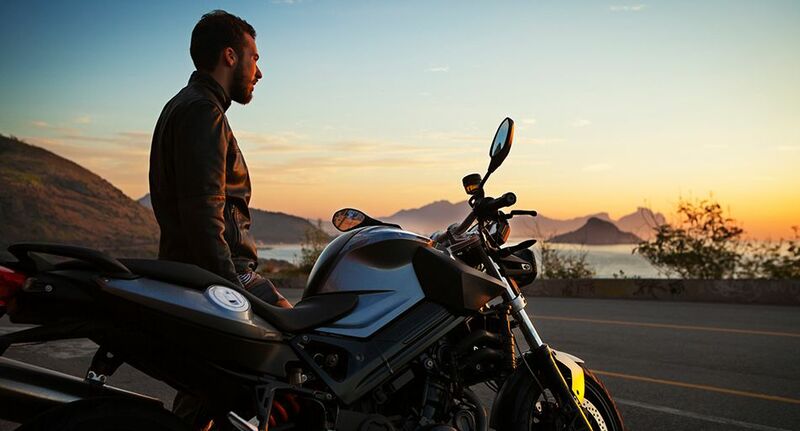 Do you choose the spaciousness of a car, or the fresh air and freedom offered by a motorcycle? And that’s only the tip of the decision-making iceberg, as you also need to weigh up things like fuel efficiency, resale value, parking, and perhaps most importantly, which one will get you from point A to point B on time. With so many things to consider, many people simply choose a car by default. However, as any rider knows, motorcycles can be mighty rewarding. No matter what you look for in a vehicle, there are plenty of worthwhile reasons to swap your car for motorcycle. In fact, we’ve compiled 8 compelling reasons to ditch your car for a motorcycle, which are sure to convince even the staunchest car enthusiast. Research estimates the average Australian driver spends approximately 100-150 hours in traffic every year . That’s almost an entire week wasted in traffic. Surely we all have better things to do than slowly inch forward in bumper-to-bumper traffic. Well, motorcycles appear to be the solution. An Australian study found that, during peak hours, a 30km trip in metropolitan Melbourne is approximately 3 times faster by motorcycle than by car. Similarly, a Belgian study estimated that having just 10% more motorcycles on the road could reduce average travel times by roughly 8 minutes for all commuters . If you’re sick of daily traffic jams, then it might just be time to upgrade to a motorcycle. At the risk of stating the obvious: cars are big, and finding somewhere to park your car can be extremely tricky. Motorcycles, on the other hand, are much smaller. As such, parking your motorcycle is usually easier, given they can fit into tighter spaces that cars could only dream of. Not only will this further reduce your commute time, since you won’t have to waste time finding a park, but it might even save you some hard earned cash, given how expensive car parking can be. Research shows the average Australian driver spends $71.50 on fuel per week, equating to $3,781 per year. That’s a lot of money. Thankfully, it doesn’t have to be this way, as motorcycles are much more fuel efficient than cars. In fact, most typical commuter motorcycles are capable of doing at least 3.92 litres per 100km, while even the most fuel efficient hybrid cars tend to give you, at best, 4.7 litres per 100km . That’s a pretty significant difference, and over time, this extra efficiency could save you big time at the fuel pump. Picture this: the warm sun, a cool breeze, the open road, and the combined scent of leather and nature. Few things beat the feeling of fresh air and freedom you experience when riding a motorcycle. It can be equal parts exhilarating and liberating. Don’t just take our word for it, though, because studies have shown that riding a motorcycle can both reduce stress and promote relaxation. A recent study found that riding a motorcycle had “a positive effect on stress levels, decreasing hormonal biomarkers by 28 percent compared to the other measured activities” . Sounds like the ideal excuse to hit the road! Motorcycles are fun. Really, really fun. That’s pretty much a given. Do we even need to elaborate? You’re roaring down the open road, adrenaline pumping, about to go on the adventure of a lifetime. Put it this way, when was the last time you went for a drive just for fun? Maybe if you’re a race car driver, but for the average commuter, your car is probably just a way to get from point A to point B most of the time. On the other hand, motorcycles can be a fun, fulfilling hobby, rather than just a vehicle. So, get your engines revving and prepare for the time of your life! If you’re keen for some fun, fresh air, and freedom, then check out 7 of the best motorcycle rides in Australia. Not only are motorcycles a whole lot of fun, they’re good for you, too. A 70kg motorcycle rider will burn an average of 170 calories during a one hour ride – roughly 40 calories more than the same rider would burn by driving a car for one hour . Plus, riding a motorcycle engages far more muscle groups than driving, giving you a great, full body workout. While this admittedly isn’t enough to forego your regular exercise routine, it’s certainly a nice bonus! Research has shown that just one month after purchasing a new car, it will have already lost 10% of its resale value. After one year, this depreciation will climb to 20%. Usually, this figure continues to increase by about 10% per year, meaning five years later the average new car will have lost roughly 60% of its initial value . This rapid depreciation can really hurt your wallet come resale time. In contrast, motorcycles are far less volatile when it comes to depreciation. Sure, you can expect a new motorcycle to lose some of its eventual resale value, but this figure is likely to be much less than it would be for a new car. When was the last time you cleaned your car? Be honest. And no, driving in the rain doesn’t count. Neither does giving it a quick spray with the hose. We mean really, thoroughly cleaned it, inside and out. If it has been longer than you’d like to admit, don’t worry, because you aren’t alone. The good news is that motorcycles are significantly easier to clean than cars, for the simple reason that there’s less to clean. This is particularly true if you mainly ride your motorcycle in urban areas, where they are less likely to get dirty than if you were riding off-road. Plus, you don’t have worry about annoying jobs like cleaning the boot, organising the glovebox, or trying to clean under the seats. They say cleanliness is next to godliness, and you’ll certainly feel godly riding your sparkling, clean motorcycle!